Todd Winget competed in the Absa Cape Epic Mountain Bike Tour in South Africa last week. I’ve copied the daily reports from the race for your review. The event was created to raise funds for under privileged children in Africa. 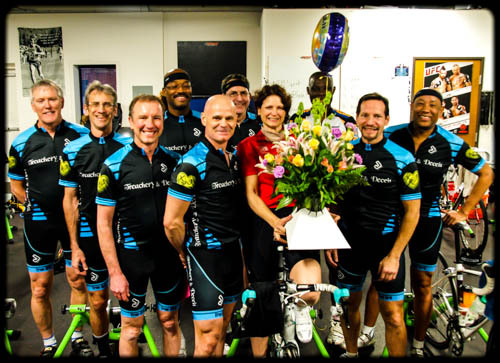 Todd and his teammate rode for Christel House with a goal of raising $50,000. 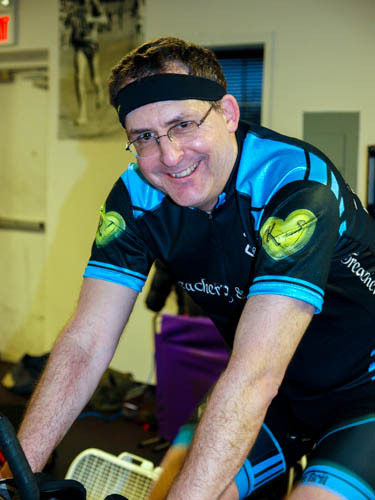 Todd personifies the type of people you all train with through the winter; tough, perservering, and community minded. Well done Todd! We are all proud of your epic achievement. When Todd returns and gets settled, I will interview him for his thoughts and reflections on this fantastic experience. (Notice how Todd steadily worked his way up the GC in his category, as well as the overall placings). The fourth prologue in the nine year history of the Absa Cape Epic set the seeding order for tomorrow’s Stage 1. Following the resounding success of the 2012 Prologue, the tenth edition of the race kicked off with a 22-kilometer prologue at Meerendal Wine Estate in the DurbanvilleWineValley – mountain biking Mecca on Cape Town’s doorstep. The event saw more than 1 200 excited riders from 41 countries enjoy sunny weather with the first group of riders starting their 8-day journey at 06:45. Set off with a bang, riders left the start chute riding through the historic Meerendal Manor House and almost immediately thereafter faced a challenging climb up “Stairway to Heaven” to the top of Dorstberg, a mountain top boasting magnificent 360 degree views of world famous landmarks such as Table Mountain, Robben Island and Cape Point. Pressed for time, teams had to forego sight-seeing as they dove straight into a rugged, Renosterveld lined trail that descended into the quarry and adjacent Hoogekraal farm, where sweeping single-track formed part of the Tygerberg Mountain Bike Club trail system. Well bermed turns made for a fun roller coaster descent as the route ultimately headed back through steep vineyards and a steady climb past dairy fields onto the picturesque Meerendal Wine Estate, finishing off with some more single-track and ensuring riders finished the first day with big smiles on their faces. Stage one was a 96km loop on virgin Absa Cape Epic territory seeing the riders starting and finishing in the town of Citrusdal, a small farming town at the foot of the CederbergMountains. After coming into Stage 1 with the Overall lead, the Swiss/Czech team of Christoph Sauser and Jaroslav Kulhavy (Burry Stander – SONGO) struck bad luck early into the stage with Sauser slashing his tire costing them some valuable time. The stage was won by Jose Hermida and Rudi van Houts (Multivan Merida) who also took the Overall leader yellow zebra jersey. Charles Keey and Darren Lill (Cannondale Blend) claimed the Absa African leader red jersey. Esther Suss and Jane Nuessli (BMC Wheeler) held onto the Ladies Rust leader jersey. Erik and Ariane Kleinhans (Team RE:CM) defended their green Mixed leaders jersey with another dominant performance. Udo Boelts and Carsten Bresser (Juwi) took over the lead in the Telkom Business Masters blue jersey. Bärti Bucher and Heinz Zoerweg (Songo.info) retained their overall lead in the Grand Masters purple jersey. Siphosenkosi Madolo and Azukile Simayile (Team Exxaro RMB Academy- Songo) held onto their overall lead in the Exxaro Development green jersey. Stage two is a gruelling 146km with 2350m of climbing and heads into the Koue-Bokkeveld known for its spectacular sandstone formations and high temperatures. Riders start climbing from early on in the stage scaling the MiddelbergPass getting them going for the long stage ahead. Stage two saw the riders leaving the comfortable town of Citrusdal heading into the Koue-Bokkeveld known for its spectacular sandstone formations and hot temperatures with their Destination Being Saronsberg Wine Estate in Tulbagh 146km later, after having climbed a total of 2350m. Stage two was the day of technical problems for many of the top riders over the several different categories. The leaders yellow zebra jersey changed hands for the third time in the 2013 event with Karl Platt and Urs Huber (Team Bulls) taking the stage win as well as the overall race lead. Charles Keey and Darren Lill (Cannondale Blend) maintained their Absa African leaders red jersey. The ladies race had a major shifting with Yolande Speedy and Catherine Williamson (Energas) winning the stage and taking the overall lead and putting on the Rust leaders jersey, after Ester Suss and Jane Nuessli (BMC Wheeler) had a bad day on the bike. Erik and Ariane Kleinhans (Team RE:CM) made it a hatrick of stage wins and retained their overall Lead. Udo Boelts and Carsten Bresser (Juwi) defended their overall lead in the Telkom Business Masters blue jersey. Barti Bucher and Heinz Zorweg (Songo.info) again held onto their overall lead in the Grand Masters purple jersey. The Exxaro Development green jersey changed hands for the first time with Prince Maseko and Philimon Sebona (Exxaro PwC Academy 1) taking the stage win and overall lead. Stage three, starting in Tulbagh which is surrounded by mountains sees the riders traversing a course of 94km taking them in a figure eight traversing vineyards and farmlands , giving them an overall tour of the basin as it is known. They will climb a total of 1950m. For Stage three, the riders awoke to a beautiful, cool morning at the Saronsberg Wine Estate, where the surrounding Tulbagh mountains played host to a 94km figure eight course accompanied by 1950m of climbing in vineyards and farmlands around what is popularly known as the Tulbagh basin. The Absa Cape Epic is known for the curve balls that it throws and today’s was most certainly the heat. Temperatures peaked at 35 degrees, and there was little relief from clouds or a breeze. The Stage was won by Karl Platt and Urs Huber (Team Bulls). Christoph Sauser and Jaroslav Kulhavy (Burry Stander-SONGO), lead by 2 minutes and 45 seconds when they took a wrong turn and lost some time, ultimately losing the stage win. Platt and Huber extended their overall lead and once again pulled on the yellow zebra jersey – Platt for the fourteenth time in his Absa Cape Epic career. Tomorrow’s stage four will include 3 major climbs coupled with extremely varied terrain, taking the riders from the Saronsberg Wine Estate in Tulbagh to the finish in Wellington 120km later, after having climbed a 2300m. Stage four saw the riders leaving the Saronsberg Wine Estate and heading away from the Tulbagh mountains towards Wellington. The riders had to deal with three major climbs one of which was the BainskloofPass as well as extremely varied terrain including a lot of singletrack before coming into the RaceVillage in Wellington. The Men’s race was won by Christoph Sauser and Jaroslav Kulhavy (Burry Stander – SONGO) who were very dominant in the stage and put the pressure on the other teams from very early on. They also reclaimed the Leaders yellow zebra jersey after three teams, Multivan Merida, Bulls 2 and yellow jersey holders on the road, Bulls missed a route marker and intersected stage 5’s route, which was already marked. The Absa African leaders duo of Charles Keey and Darren Lill (Cannondale Blend) could not hold the pace at the front of the race today and lost a sizable chunk of their lead, however they still remained in the Absa African Leaders jersey. The Ladies race was won again by Yolande Speedy and Catherine Williamson (Energas). They increased their lead in the Ladies rust leaders jersey competition. 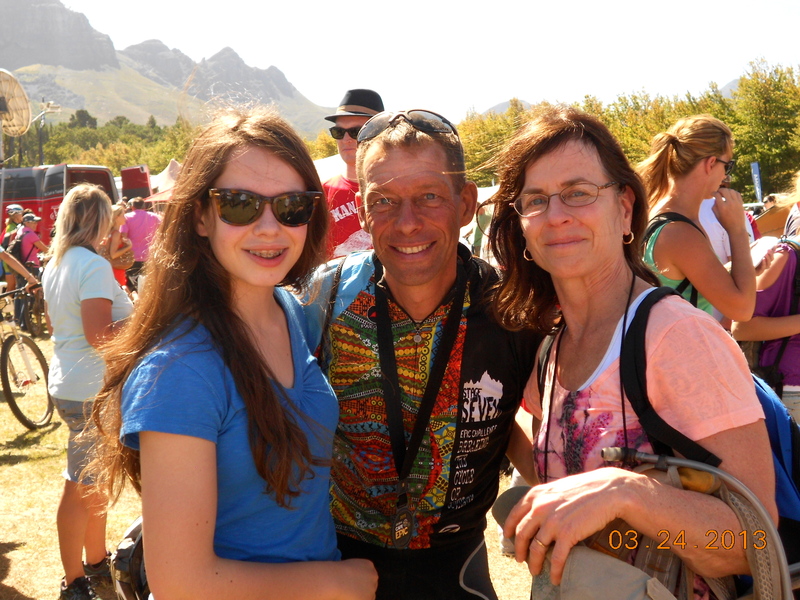 The Mixed competition was won again by the formidable due of Erik and Ariane Kleinhans (Team RE:CM). The New Telkom Masters blue Jersey holders of Nico Pfitzenmaier and Abraao Azevedo (Bridge) rode a very good race today coming in just behind the days overall Stage winners. Barti Bucher and Heinz Zorweg (Songo-info) rode a consistent race once again to take the stage race and extend their lead in the Grand Masters Purple jersey. The Exxaro Development leaders green jersey changed hands once again after the days leaders Azukile Simayile and Sipho Madolo (ExxaroRMBAcademy) had to abandon the race due to medical problems. The jersey now sits on the shoulders of Prince Maseko and Philimon Sebona (Exxaro PwC Academy 1). Stage five is like a bonus day – short, sweet and, most importantly, great fun! The relatively short distance of 75 kilometers offers more single-track than any previous Absa Cape Epic stage, featuring some amazing cross-country terrain and lots of twisting ups and downs – all in all an extra enjoyable day to re-energise body and mind. The fifth stage was like a bonus day – short, sweet and, most importantly, great fun! Riders already had a taste of the Bain’s MTB Trails at Welvanpas on the day before. It was a fantastic purpose-built network of single-track, perched between the Wellington vineyards and the slopes of Bainskloof. In the Men’s race it was a show of power with Sauser and Kulhavy of Burry Stander – SONGO winning the stage. They also extended their lead in the yellow zebra leader competition over the Bulls team of Karl Platt and Urs Huber in second place. In the Absa African leaders red jersey Philip Buys and Matthys Beukes of SCOTT Factory racing took the lead away from Darren Lill and Charles Keey of Cannondale Blend after winning the stage. In the Ladies category, Yolande Speedy and Catherine Williamson (Energas) won their fourth consecutive stage and extended their overall lead over their compatriats. 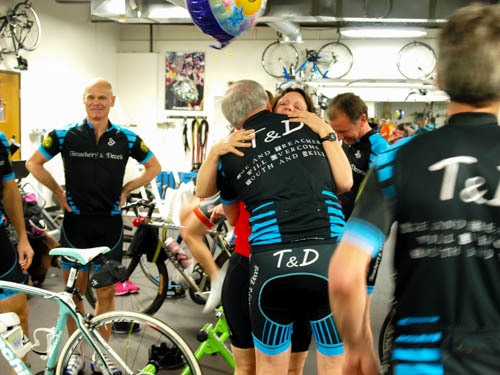 In the Mixed category Theresa Ralph and Damian Perrin of Biogen Britehouse won Stage 5, breaking the winning spell of the Kleinhans duo of Erik and Ariane of Team RE:CM. The Kleinhans duo still hold a healthy lead in that competition. 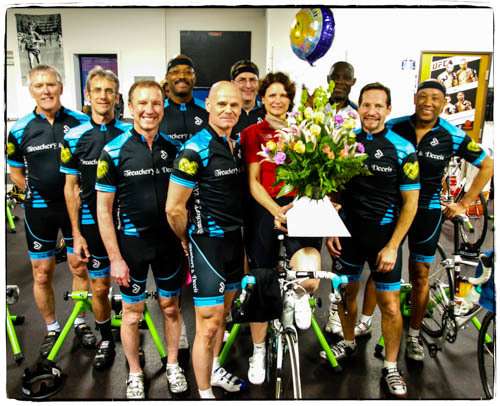 The Telkom Business Masters blue jersey was again won by Nico Pftizenmaier and Abraao Azevedo of the Bridge team. This is their third consecutive stage win. 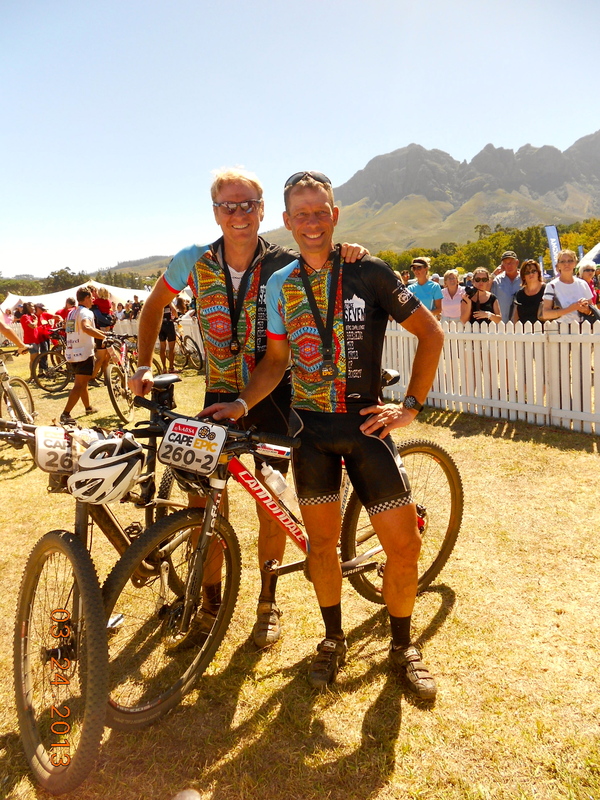 Bärti Bucher and Heinz Zoerweg of Songo.info again finished in first place in the Grand Masters having won all other stages of the 2013 Absa Cape Epic. Prince Maseko and Phillimon Sebona of Exxaro PwC Academy 1 won the Exxaro Jersey for the third consecutive stage. Stage 6 sees the riders tackle the penultimate stage of the 2013 Absa Cape Epic. 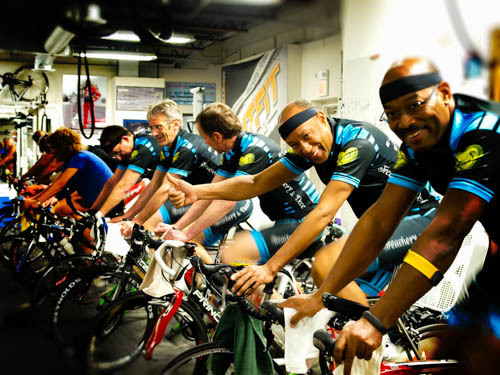 Riders should prepare themselves for a long day in the saddle. The stage will see the riders move from Wellington through to Stellenbosch over a distance of 99km climbing a total of 2950m. With a maximum stage time of 10 hours, riders had to prepare themselves for a long stage, the last real hurdle of the 2013 Absa Cape Epic. The first 20 kilometers were primarily in the forestry plantation on the slopes of Du Toit’s Kloof, with a steady 10-kilometer climb followed by an equally long, fast descent interrupted occasionally by some soft forest single-track. The second major climb was primarily through orchards that soon gave way to mountain fynbos as the trails turned more rugged, including another single-track descent, but riders had to watch out for the handle-bar-grabbing fynbos. By the time riders crossed under the N1 national highway at the 35-kilometer mark, they completed almost half the climbing of the day. The next section was fast going along farm and gravel roads along the DrakensteinMountains towards Franschhoek. The route made the turn towards HelshoogtePass, as the trail hugged the steep slopes of the iconic SimonsbergMountain. Riders passed through wine farms and the IdasValley before passing underneath the R310 road. From here it was one last steep climb, before a descent sweetened by some more forestry single-track that took riders into the race village. Today was meant to be the king’s stage with some huge climbs in the beginning and steep climbs at the end. It rained last night and conditions were quite cool today. By the middle of the race it was down to two teams – Burry Stander – SONGO and the Bulls, with the other two Bulls teams and the Absa Africa Leader jersey team of Buys and Beukes (SCOTT Factory Racing) in pursuit. Sauser and Kulhavy (Burry Stander – SONGO) attacked on the final obstacle and the gap grew quickly to 2 minutes and 37 seconds. Tomorrow riders will travel the 54km with 1500m of climbing from Stellenbosch to the Grand Finale at Lourensford Wine Estate in Somerset West. The final stage of the 2013 Absa Cape Epic was short, with only one major climb at the halfway mark. Riders left Stellenbosch along the mountainside through Coetzenberg and EdenForest, then worked their way into the Stellenbosch Winelands. The trail climbed up through the vineyards, opening up spectacular views of False Bay, as far as Cape Point, and back to TableMountain and Durbanville, where the journey started seven long days ago. Having mastered the 9km climb up the side of the HelderbergMountain into the Lourensford Neck, the finish line was almost within sight as the view into the striking Lourensford bowl opened up. This is the first time in Absa Cape Epic history that riders approached Lourensford Wine Estate form a totally different direction and not via GamtouwPass. The final 25km were predominantly downhill, on forestry slopes. The final run onto the lush green polo field packed with grandstands, marquees and supporters was unforgettable for the 2013 finishers. Jose Hermida and Rudi van Houts of Multivan Merida won the final stage of this year’s Absa Cape Epic while the Burry Stander – SONGO team of Christoph Sauser and Jaroslav Kulhavy walked away with top honours as overall winners of this year’s exciting race. The Absa African Jersey was won by Philip Buys and Matthys Beukes of SCOTT Factory Racing after they finished second on stage 7 in a sprint finish behind Multivan Merida. Yolande Speedy and Catherine Williamson of team Energas won the Ladies category. In the Mixed category, the RE:CM team of Erik and Ariane Kleinhans won overall honours after being dominant all week. The Telkom Business Masters category was won by Nico Pftizenmaier and Abraao Azevedo of the Bridge team who proved too strong over the week. Barti Bucher and Heinz Zoerweg of Songo.info won the Grand Masters category after winning all 7 stages as well as the Prologue in this year’s race. Prince Maseko and Phillimon Sebona of Exxaro PwC Academy 1 won the Exxaro jersey. 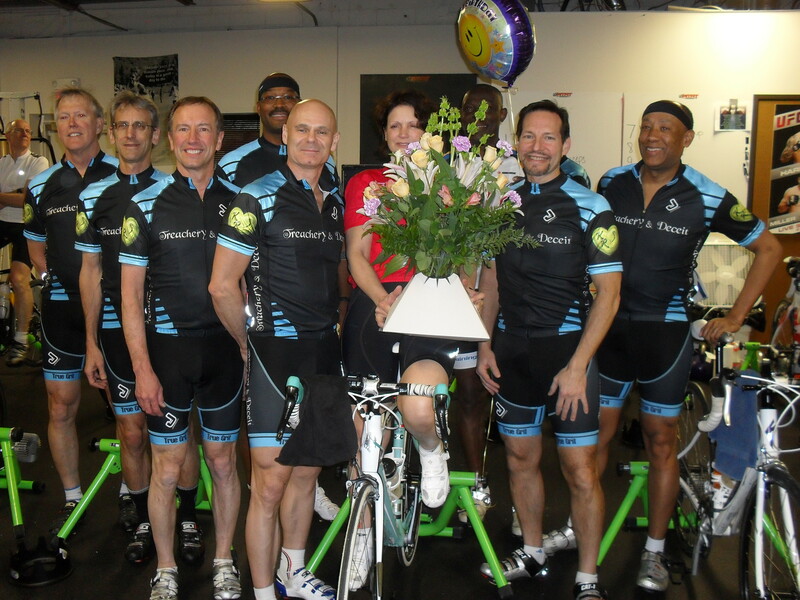 They fought hard to retain the special jersey each day and proved to be the strongest team standing within the ExxaroAcademy in the 2013 event. To win a first race of the season is quite a thrill, but to win a bucket list race is almost beyond words. Hillsboro Roubaix is modeled after the famous Paris-Roubaix that rolls over multiple sections of ‘pave,’ roads created from brick and stone (cobbles) in the 1700s. The roads beat the riders so thoroughly, riders often feel sore for days after. Weather conditions play into the lore of the race as well, be it snowing, raining, or overwhelming heat, the unpredictable weather poses additional challenges to those who aspire to win it. The lore of the race calls for a ‘hard man’ to overcome all the challenges of this particular course. 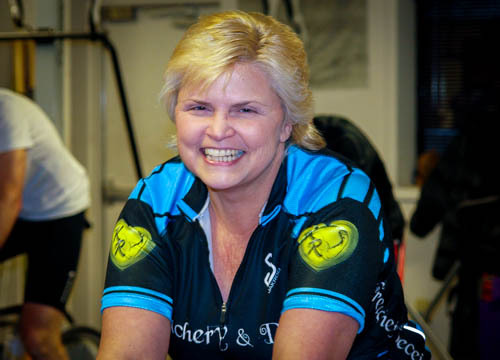 When one thinks of the hard men of cycling, they often envision the Belgian, training through snow, cow pies, cobbles, and gail force winds, in preparation for their beloved spring classics. Because I’ve never been a particularly good climber, nor a pure sprinter, I’ve always (leap of imagination here) classified myself a Belgian styled rider. I do truly enjoy racing in the rain. 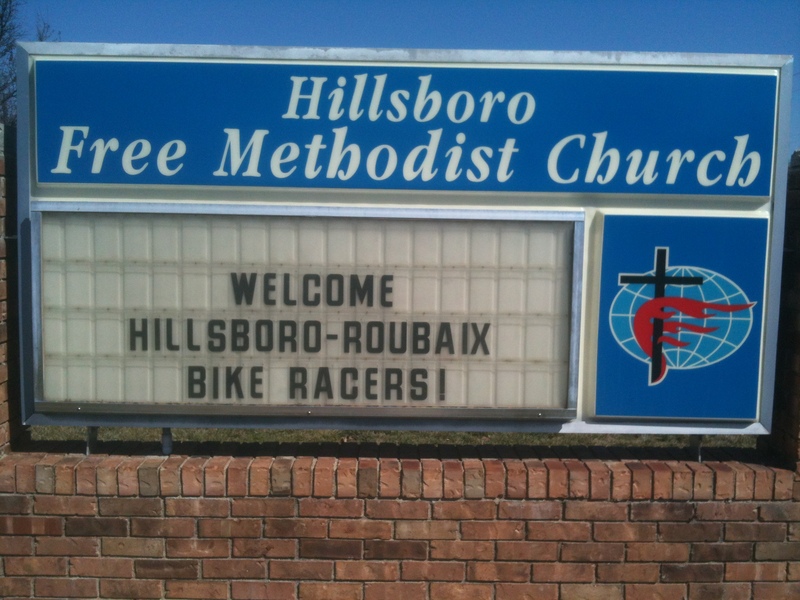 Naturally, I’ve long wanted to win Hillsboro Roubaix. Like the famous pro race, Hillsboro features Belgian-style cols, including two leg stingers at the end of the course, sometimes ferocious winds, and rough roads, including bricks over the final mile of the course. Last October when indoor training began I asked all participants to make goals for their winter training. Some wanted to lose weight, some wanted to improve cadence, some wanted to increase power at threshold, and others chose event goals. 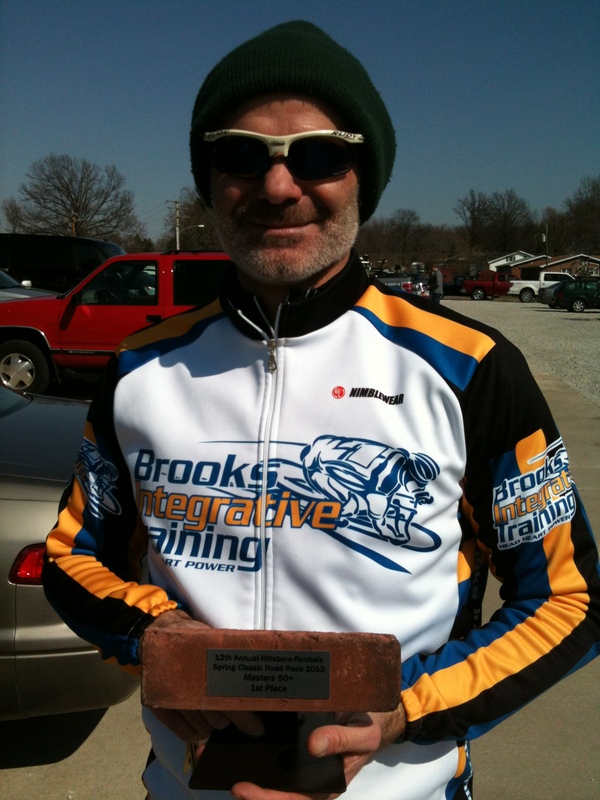 Although I never shared it, my goal was to win Hillsboro Roubaix. It’s been a process that could not have been accomplished without all of you who regularly participate in my winter training classes. I would not train so hard if I did not have you guys to motivate me or be accountable to. When I look out over the class and see Ken Green busting it to meet the objective, or when I see Sandy Raynor giving everything she has for those last 20 seconds, I tell myself, I, too must dig deeper. 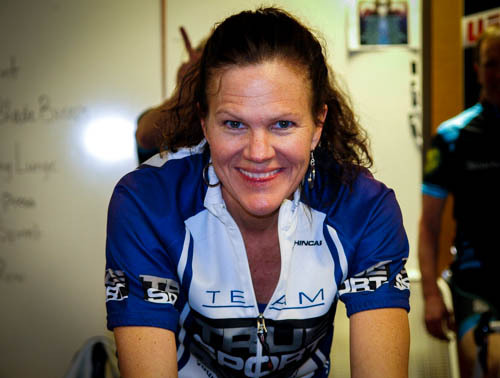 When I see Angelia Kniesly’s intense focus on the task at hand, it reminds me that this is not the only moment; I must also remain diligent with nutrition, rest, hydration, and all the things to go into goal achievement. It should also be pointed out that Dr. 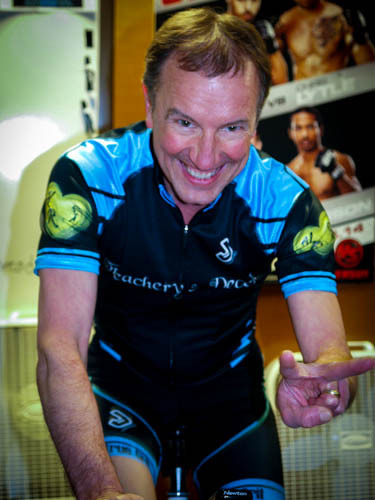 Rob Schroeder and Indy Muscle Therapy’s Keith Caskey have been instrumental in helping me overcome a significant physical barrier that has limited me for many, many yeras. So thank you to all of you for your inspiration and support. Deb and I arrived in Hillsboro, IL Friday afternoon and drove the course to check out the gravel sections. I took notes so I’d remember when to be near the front to avoid chance bad luck or to avoid being stuck in the gutter. After the course reconn we enjoyed dinner at the Court House Inn of Vandalia. The predicted weather for this year’s event, earlier than past years, btw, was for cool temps with overcast skies and a chance of precip. I decided to grow my beard due to the cooler than normal temperatures. But Mother Nature smiled on us racers yesterday, breaking the sun out just as the racing began. Winds were strong from the east/northeast, but conditions were dry. The Masters racers cover two laps of a 28.75 mile course. Most everyone remained together until the two hills at the end of lap 1. 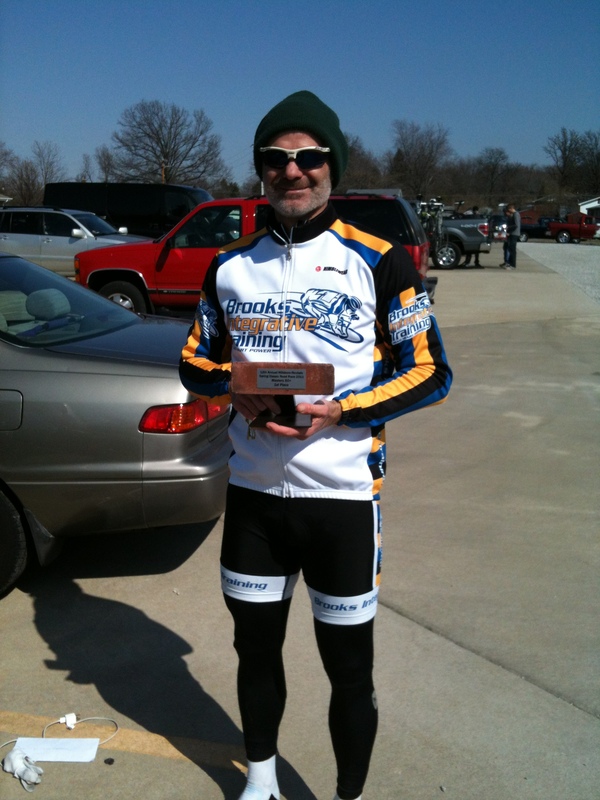 Major kudos to Mark (can’t recall his last name right now) of St. Louis for being aggressive throughout the race. Early on, he established a 30-second gap so John Schmitz of Indie Bike and myself took up the chase, bringing the leader back after a bit of effort. Several fruitless attacks ensued over the remainder of lap 1, but the east wind was a bit much to overcome for a solo rider or just a few riders. Taking note, I decided to ride conservative through lap 1. I was pleased to see Mark Dewart and Jim Creamer leading the pack up the final climb of lap 1. In particular, I was very proud to see Mark spinning his light gear, seated all the way up the leg stinger. That effort dropped several riders, thinning the pack as we completed lap 1. Just beyond the finish line, the course features two big ring climbs. Myself and a couple other riders put pressure on over these hills, further thinning our pack down to what eventually became the final selection of 9 riders, including Jim Creamer and John Schmitz. The aforementioned Mark of St. Louis was like the Cancellara, attacking often, but just could not get away. Bob Downs of Wisconsin Marked every move, but never once took a hard pull through the rotation. Other riders became perturbed by Downs’ passive riding. A couple of other riders also took flyers and I countered a few of the attacks, but none of us could ever establish a break because Downs would reel it in and then sit up. Again, taking note of the pattern, I played poker at the end of the race. I attacked with perhaps 7 miles to go, thinking that I was setting them up. I did not think I would stay away with that attack. Sure enough, I was brought back. At perhaps 6 miles to go, Aggressive Mark and the other aggressive rider (Randy Warren of Chicago) made a strong move and opened the gap. I did not chase them. Aside from Downs, the others in our group were too tired to chase. So I sat, and waited, and waited, and waited, until finally, Downs jumped to cover the move up the road. 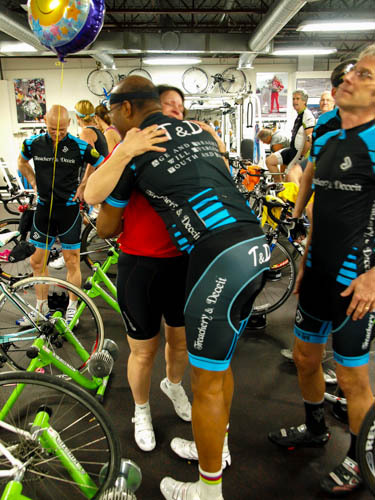 After the race, Randy Warren of Chicago and Aggressive Mark of St. Louis were gracious in their congratulations. I offered to share my prize money with Mark b/c I felt he rode a hard race and deserved some type of reward for his efforts. He graciously declined. It’s a great thrill to have won this race, but again, I could not have stayed the course in my preparation without the support and friendship of all you Brooks Integrative Training athletes. Although we have a big snow storm headed this way today, I look forward to seeing all of you on the road soon. Don’t forget our 5-mile TT this coming Thursday, weather permitting. 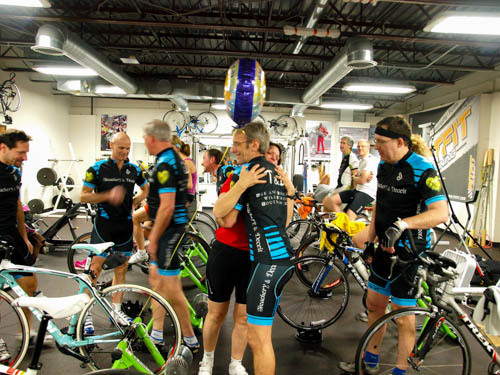 And look for Monday Night Recovery rides when the weather finally breaks. Adam Perler was kind enough to take several photographs from the final class. I’ve shared these to compliment the coummunal spirit I wrote about on Friday. Photos aside, it was a great weekend to get out and ride. Some of you participated in the Sub-9 Death March. I’ll report on that upon hearing from participants. Many B.I.T. riders took advantage of the weather break to put in valuable road miles. Personally, I rode 65 miles both days this weekend. Enjoy the photos. Big thanks to Adam! Another winter season has come and gone. With the season past, some faces disappeared while new faces filled their spots in the community we have created. It was a pleasure working with so many new folks this year and even more pleasing to experience their enthusiasm when they’d share their personal improvements with me. I’ve mentioned Mark Dewart and David Wilkes in other posts. Even on the final night, folks were still improving, as evidenced by Frank Oboh who proudly informed me he hit a max cadence of 177 rpm. Frank is a big, strong man, a guy who ran a 1:47 800 meter in his prime. As such, Frank normally pushed bigger gears to keep up on the rides. You can imagine his delight and wonder at achieving those 177 rpms. I mentioned our community; this group of people rides together, suffers together, and laughs together. The communal E’spirit de Corps was never more evident than in an incident last night. Dan Cole, one of the founding members of this community, made the trip up from Bloomington to share some suffering, some laughter and some beer with his good friends. Before class even began, Dan’s seat post broke. 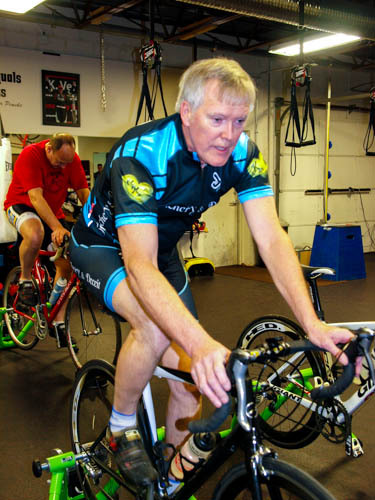 We scrambled to remove Dan’s pedals from his bike and swap them out with one of the standby bikes in the PitFit facility, ensuring Dan would get his workout along with all his friends. And last night’s final class of the season was a reflection on the past and the future. Our dear friend, Dr. Karl Raynor, passed away last spring, leaving a gaping hole in our hearts. 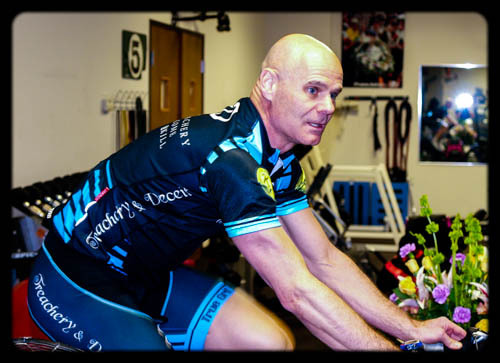 Karl eptitomized what this group is about; a heart of gold and the strength of two riders. Whenever one of the group was having an off day, there was Karl to shepherd them through the ride. Whenver one of the group was feeling frisky, there was Karl to track them down. 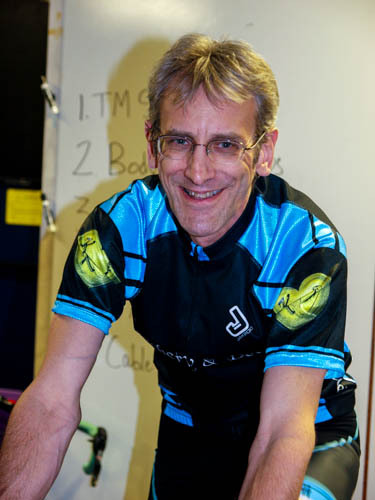 Outside of cycling, Karl was always the first to respond to a request for help, offering his incredible strength or one of his valuable resources, as necessary. Yet Karl was not without his mercurial side. His sense of humor and quick wit often led to the trash talking so often affectionately bantered among group members, thus giving rise to the team name, Treachery and Deceit. As the name implies, do whatever it takes to beat your buddy to the next imaginary finish line. But the name is also one of tongue in cheek humor, reminding us not to take ourselves too seriously. To honor Karl’s everlasting mark on each and every one of us, Dr. Adam Perler designed a special T&D Tribute Kit. Note the Gold Heart on each sleeve in the photo above. And also note Sandy Raynor at the center of the photo. Yesterday was also Sandy’s birthday. 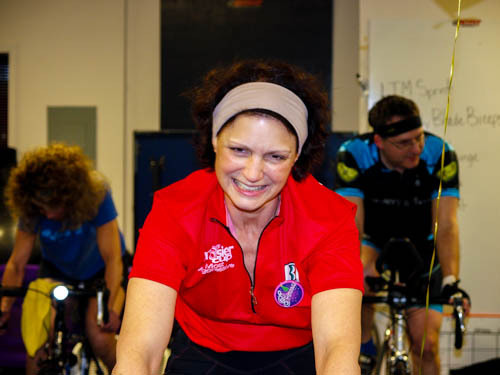 Those of us in this community were proud to share our suffering and our camaraderie with Sandy this winter. We look forward to sharing the road with her in the upcoming warmer months. 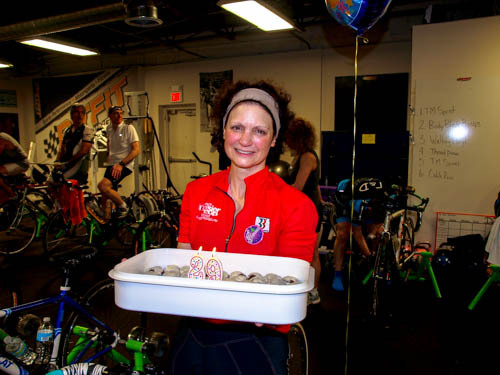 As Karl would have done for any of us, we all will be there for Sandy as she navigates her way forward, one pedal stroke at a time. As we transition to the outdoor season, remember your ride buddies; offer that water bottle when necessary; offer a draft as needed, give a push here or there. 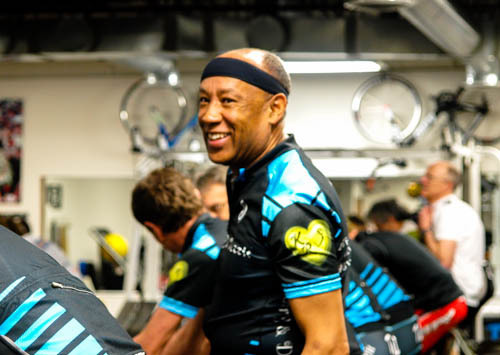 Cycling is a lifestyle choice we embrace. We appreciate each other’s commitment and each other’s sacrifice. Remember the feeling of inclusion you had this winter and take action when called upon. Thank you to all of you who made this such an enjoyable winter. I’ll see you on the road soon.